Kirstie and Phil were right, it really is all about location, location, location. Whether it’s prime position in the bustling heart of the city or on a far-flung beach where you can put your toes in the sand, location can make or break your honeymoon. And a great location usually means one thing: great views. Imagine waking up to the sunrise over Central Park, skyscrapers glittering in the early morning light. Think of the possibilities of being smack bang in the middle of the action, without having to walk miles to visit attractions. Or what about sunset, watching with a frosty drink in hand as the setting sun stains the skyline crimson as it slips below the horizon. Here we’ve narrowed down some of our favourite views in the world that you can see from your hotel window. 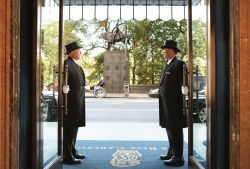 In the heart of Midtown, Manhattan, on the corner of Central Park South and Sixth Avenue, you’ll find the incredibly glamorous Ritz-Carlton New York, Central Park. 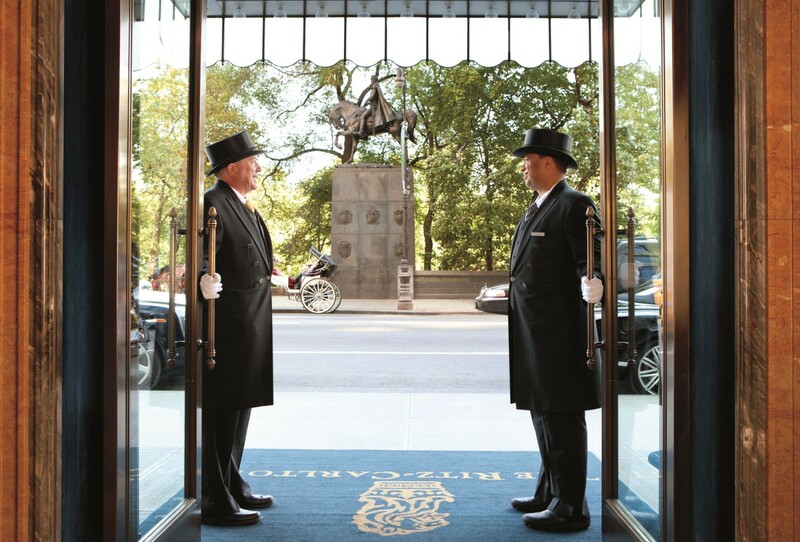 The hotel overlooks one of the Big Apple’s most recognisable landmarks, Central Park. Designed as an urban oasis by Frederick Law Olmsted in the mid-19th century, the park has endured through constant development and remains the city’s lungs to this day, a great expanse of lawns, lakes and leisure venues for everyone to enjoy. The Ritz-Carlton overlooks the park and that iconic New York skyline so you can wake up to park or city views, or perhaps both if you choose one of the opulent suites. Many of the hotel’s rooms and suites are furnished with telescopes, so you can get an even closer look from the comfort of your bedroom window. 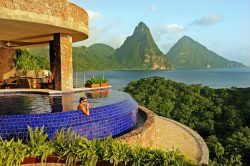 Jade Mountain is like something out of James Bond, a secretive lair hidden within the foliage of St Lucia’s jungle-clad interior. The hotel itself is made up of private stone walkways and tranquil koi ponds, unassumingly leading to the main event. The rooms. 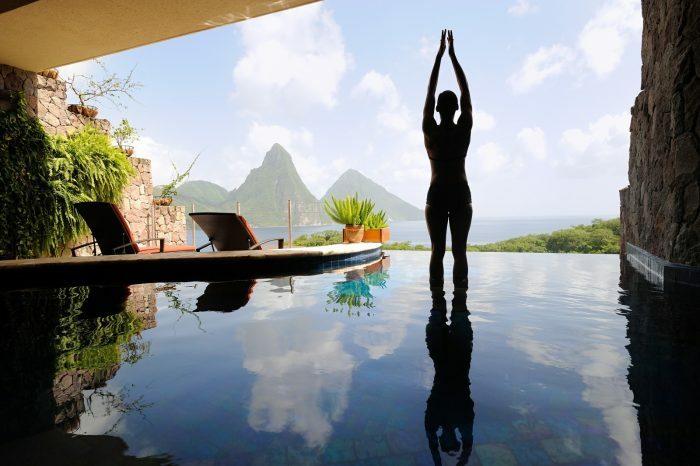 Every one of its vast suites is made up of just three walls, the fourth completely open to the elements and the staggering panorama of the Twin Pitons and the bay. Most of the suites also have private infinity pools from which to admire the view, and adjustable fibre optic lighting means you can tailor your refuge to fit your mood. 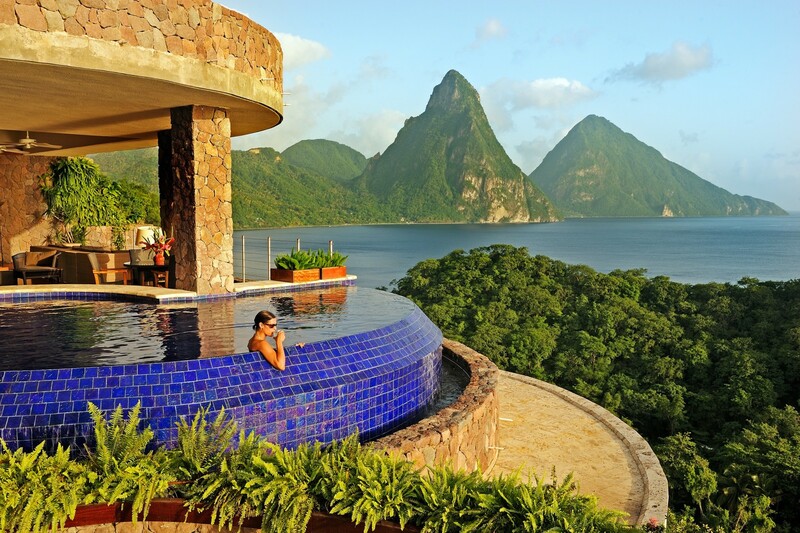 We like the Moon Infinity Pool Sanctuary, with its deep cerulean furnishings that match the sea below and a curving sweep of an infinity pool. 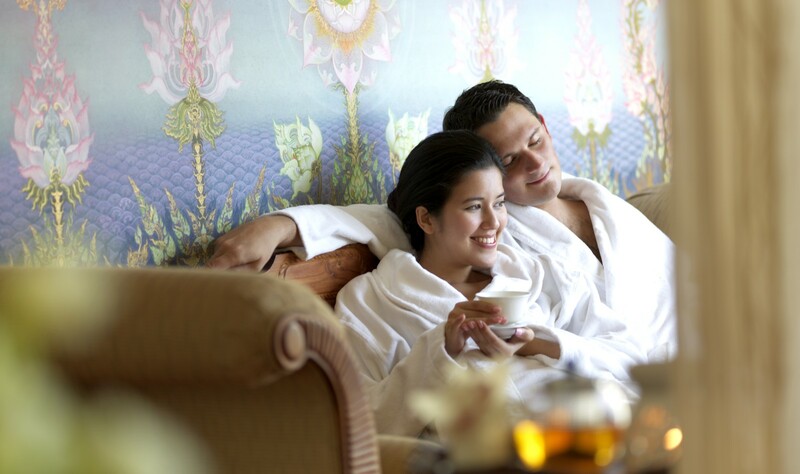 You’ll have seen the pictures of Banyan Tree Bangkok. A great streak of a building surging skywards on South Sathon Road in the city’s glitzy business district, topped with a bar that offers 360-degree views of the skyline. Did we mention it’s open air? Bangkok invigorates the senses in every way – gilded temples smoky with incense, fiery cuisine, the constant thrum of traffic – but head up to the 61st floor and prepare to be blown away. Enjoy an alfresco dinner overlooking the dazzling city lights at Vertigo, appropriately named, before a cocktail at Moon Bar. Head down a few floors to your room and you can still enjoy those amazing views, perhaps from the comfort of your bath as you gaze out of the panoramic window. 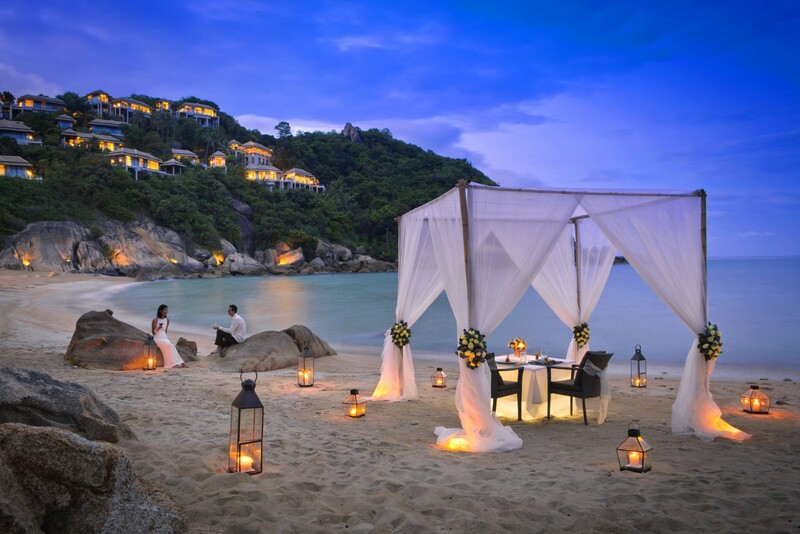 Combine your stay in Bangkok with the tranquil island paradise of Banyan Tree Samui for the ultimate city and beach honeymoon and views over the Gulf of Thailand. 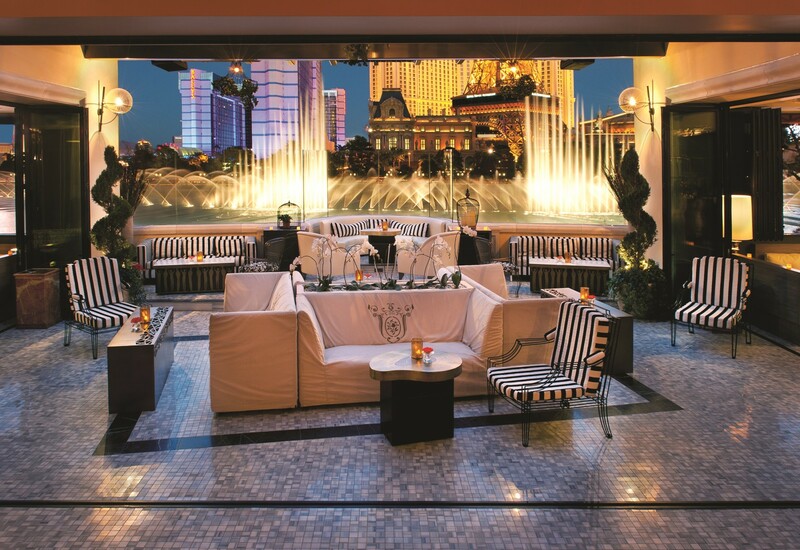 When staying in Las Vegas it’s a case of go big or go home, and the Bellagio offers the ultimate Las Vegas experience. With the best position on the Strip, this mammoth resort hotel looks over a half-sized replica of the Eiffel Tower from a 36-storey tower. So far, so flash, but that’s before we get to the lake. In the front of the Bellagio is the eight acre, man-made lake that is the setting for the Fountains of Bellagio, a vast, choreographed water feature set to light and music, taking place every 15-30 minutes. They cost an estimated $40 million to build, so you can imagine they are quite spectacular. 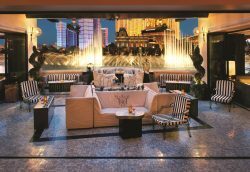 You can book a room that directly overlooks the fountains and the Las Vegas strip, complete with marble flooring, cashmere-topped mattresses and a soaking tub. 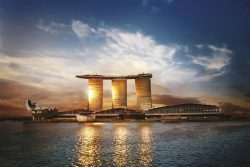 Home to one of the most iconic infinity pools in the world, the Marina Bay Sands Hotel is spread across three skyscrapers topped by a giant platform that’s designed to look like a ship, known as the SkyPark. Soaring 57 levels above the city, the infinity pool stretches 150 metres across the deck, making it the world’s largest rooftop infinity pool. 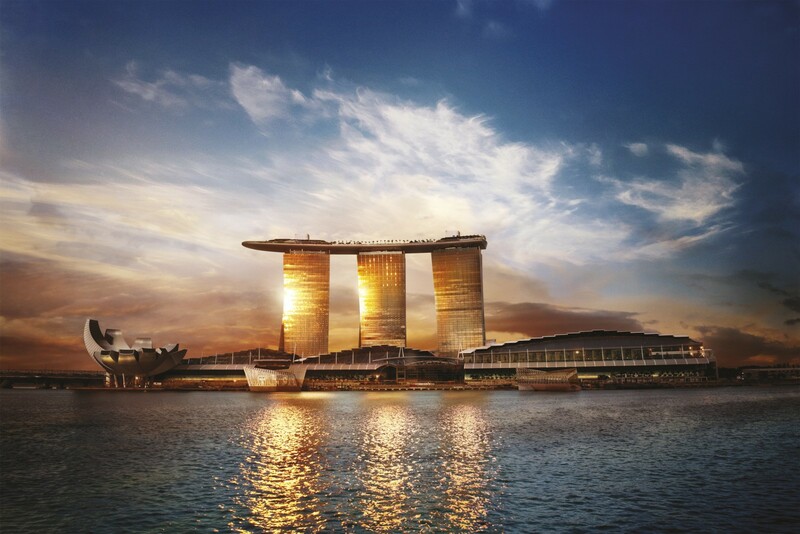 As a guest of the hotel you’ll have access to the pool and a colossal observation deck, offering unparalleled views of Singapore’s modern skyline. The rooms themselves also have views of the city, the Singapore Strait or the Gardens by the Bay, so even when you’re not relaxing poolside you can still lap up those incredible views. We couldn’t stop at just five so we’ve included a sixth bonus option for those travelling to or through the Middle East. 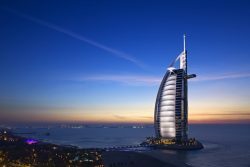 The iconic sail of the Burj Al Arab is probably best known as a stunning view in itself, but consider the views from the top. Stay at the hotel or take afternoon tea in the Sky Bar and enjoy Instagram-worthy views of the ever-growing skyline, the Palm Jumeirah and Jumeirah Beach. 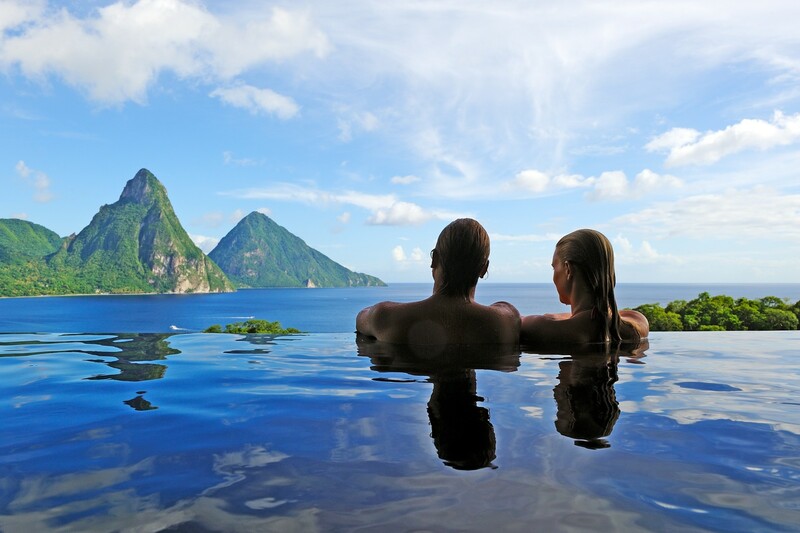 For more honeymoon inspiration, contact one of our honeymoon planners on 0203 3977 585.